The Google Play Store is usually the go-to place for Android Apps, but it’s not the only place. Though Google doesn’t allow other apps stores to be downloaded from within Google Play itself, that doesn’t mean you can’t get them. Here are the 6 best app store alternatives to the Play Store. Check the unknown sources box. This will now let you install apps (or APKs) from outside of Google Play. Go here for a full explanation of what an APK file is and how to install them. As a word of warning, enabling unknown settings means that the apps installed do not have Google’s seal of approval. And it also means that the apps you download through these stores may not have Google’s in-house security either. We’ve done what we can to verify the apps stores recommended here, but be careful when downloading updates or any other apps, especially something that offers a normally paid app for free. When looking beyond Google Play, the Amazon App Store is the place to start. Here you can get thousands of free and paid apps, as well as paid apps for free. Amazon gives away a paid app for free every day and using Amazon's dedicated app store is the only way to access them. Amazon also regularly offers free bundles of paid apps (good ones, too). Aside from great free titles, the Amazon App Store has a huge selection of books, movies and songs – often at lower prices than on Google Play. Download the Amazon app at the link, but be aware that you must have an Amazon account to use the service. GetJar is an alternate app store app with a vast array of free apps to download. These can be filtered with the categories (and subcategories), which are mostly the same as in the Google Play Store, such as Productivity, Finance, Photos, among others. GetJar isn’t just for Android phones either, it has cross-platform support (iOS, BlackBerry, Windows Mobile etc), and also employs user comments (likes and dislikes, and Facebook support). You can use the GetJar website to download and access apps or you can download the dedicated GetJar app store APK. F-Droid can be installed from the official website, and it certainly presents a refreshing idea. Unlike other app stores, F-Droid is funded by donations, and the apps themselves don’t have reviews or ratings. But all of the apps contained within there are FOSS (Free and Open Source Software). It's an excellent app store for developers because anyone can access the code of these apps for free. You might find a particular app feature or functionality which you like and would want to use for your own app, and you can, just access the code and copy it. The downside is that the apps are not always as "professional" as can be found in stores like Google Play and the Amazon app store. Still, for developers, it's highly recommended. One of the most sophisticated app sources is Aptoide. It works with a distributed network of different store providers and unifies them under the Aptoide platform. However, this poses considerable security risks. Given the potentially hazardous situation, Aptoide should only be used by experienced users who can spot pirated or suspicious software. With 2.5 million malware-tested apps available, Uptodown seems to be a reliable Play Store alternative. The number of specific Android apps is significantly lower with an official count of "30,000", but it proves to be sufficient. The installation packages are available to download on the website but it is advisable to install the uptodown app first. This will inform you about available updates in the future. In the short, anonymous setup you can decide if you want to be informed about new app versions or if you would rather be left alone. Then you can browse the store. You'll soon notice something missing: There is no paid content. Uptodown has no payment system. This means that no apps or in-app purchases can be paid for. So paid apps are either not found at all or start with an error message. Commenting on the sensitive issue of app quality, Tomás Ratia, Advisor Strategy and Growth, explains that Uptodown initially uses Virus Total to automatically check the 2.5 million APKs with 50 anti-malware engines. In addition, a local editorial team takes care of manual quality control and creates neutral tests in text and video formats. Indeed, Uptodown seems tidy. During several test searches, we did not notice any counterfeits or pirated software that is often seen in the other Play Store alternatives from Aptoide or Amazon. 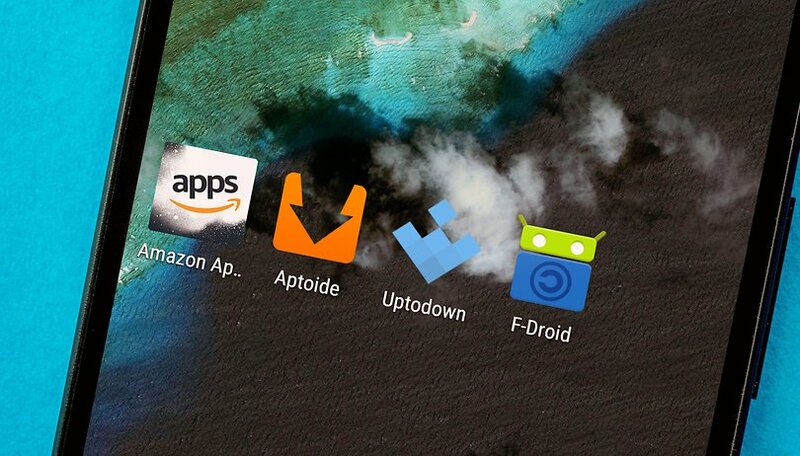 For free apps, we can certainly recommend Uptodown. Unfortunately, the apps versions tend to be older compared to those from Aptoide or APKUpdater. Unlike the play-store alternatives shown previously, APKUpdater pursues a simpler goal: it delivers updates earlier than others. You want to use the new WhatsApp features sooner than your friends? Facebook drains your battery too much? Then you need the APKUpdater, because it informs you about available updates earlier than any other Android App Market. The new versions are either downloaded from APKMirror, APKPure or via Evozi from the Play Store. They all have a good reputation, but are not as safe as F-Droid or the Play Store. In addition, you have to download each time to the respective website, which can mean exposure to dodgy ads. Unlike the other app stores mentioned, APKUpdater does not offer a search function, and only updates apps you already have. What do you think is the best alternative to the Google Play Store? Let us know in the comments below. I personally think that developers who want money for their apps should be paid. Most of the time, they aren't even asking for much. AndroidPIT doesn't support pirating apps, and only getting paid apps for free when the deal is officially closed with the developers themselves. Sorry but Aptoide is way better. Someone else mentioned it above, to which I stated that we don't really support pirated apps because developers deserve the support and if they ask money for their apps, it's because the app is (supposed to be) better, have no in-app advertisements and other perks. If you are looking to get paid apps for free, I would recommend Amazon Appstore, they have different paid apps for free or discounted daily. Some of those listed provide direct installs through their own apps, others provide APKs to be installed by Android itself. For any and all, I'd recommend installing reliable third party malware scanning software, which will essentially replicate Google Play Store's own scanning on every new install or update. UpToDown has an important advantage over Play Store and some other sources, in permitting users to download earlier versions of apps, which are often more compatible with older devices or don't have stupid new developments. I'd throw in Softpedia as a safe source that recently added Android apps to its long standing PC software library, with pretty good reviews and news. Amazon also have app store!!! Such a great share. How many apps can you really use? Waw, a lot of applications ! I back up my sms, multimedia files contacts etc via Mobogenie. after reset my phone i try to restore sms to my phone but getting no success. The mobogenie show " mobogenie.exe has stopped working"
Guys please help how to restore my sms from my pc to my phone becauase all sms are very important to me. Thanks for this post. Very interesting and top play store alternative. Great Post. Wow , very interesting article . AppBloo Market is an alternative way to browse the large and growing number of android apps and games. It will be our pleasure to have you on board! but i have some more sites to upload your APK files and Free. I'm also doing a blog about the best Google Play Store alternatives . Appland offers developers to upload their app in one single place and then all their App Store customers can review the app and the approve it.